A PAIR OF Dutch nationals appeared in a British court today after authorities seized one of their largest-ever hauls of cocaine, aboard a yacht off the south-west coast. They have been remanded in custody and are due to appear next in court on 20 August. The duo were arrested on Thursday after the Netherlands-registered boat that they were travelling on was intercepted by a Border Force cutter 193 kilometres off the far southwestern county of Cornwall. Its National Maritime Intelligence Centre aided the operation alongside a European analysis and operations centre for narcotics in Lisbon and law enforcement partners in Portugal, France and the Netherlands. “This is a huge haul of class A drugs, one of the largest seizures of class A ever in the UK, and with a potential street value likely to be in the hundreds of millions,” said Andy Quinn, NCA regional head of investigations. “The criminal trade in drugs is driven by financial gain, and the loss of the profit that would have been made from this seizure it will be a major hit to the international criminal networks involved,” he added. 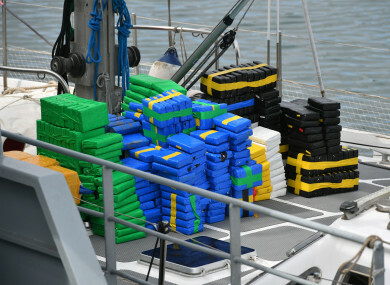 The largest seizure of top category drugs in recent times in Britain remains the April 2015 capture of around 3.2 tonnes of cocaine, which was recovered from the tug boat Hamal, sailing off the coast of Scotland. Turkish sailors Mumin Sahin and Emin Ozmen were later jailed for at least 20 years following a trial in the case. Email “Dutch nationals appear in UK court charged with massive cocaine seizure”. Feedback on “Dutch nationals appear in UK court charged with massive cocaine seizure”.